Well, it’s been a few days since I last posted. My new job has been keeping me busy, but I’m happy about that. Busy is exactly how I like to be. Anyway, I have been keeping it simple with meals as promised. Tuesday’s dinner was a hit that was super simple to prepare. I was just throwing together what I had laying around, and it turned out phenomenal! I love when simple things turn out great. This will definitely be making frequent appearances. I marinated some chicken in dijon mustard, maple syrup, and red wine vinegar, tossed it in the oven for about 35 minutes and topped it with rosemary. Then I took some butternut squash I had already chopped and frozen (trust me–pre-cut butternut squash is a gift from GOD. Those things are evil. If you haven’t worked out for the day go chop a butternut squash.) 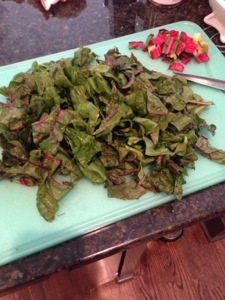 sautéed in a little butter and olive oil, added some chile powder and pepper and then set aside. 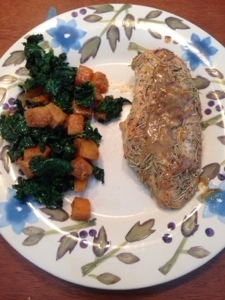 Then I sautéed some kale until it was tender and then added the butternut squash back in. So simple, but awesome. Wednesday I just snacked throughout the day and never actually ate a real meal. Thursday was a tad more structured, with grilled cobia and broccoli for dinner. 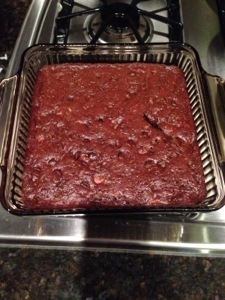 PMS hit hard so I whipped up a batch of paleo zucchini brownies–bad idea. It’s going to be hard not to make these all the time now cause HOLY COW they are so good. Pop in the oven at 350 for 350 minutes and you have heaven in a pan! I actually went out on my lunch break yesterday, and I want to give props to Panera for their new hidden menu cause it’s amazingly healthy. I had previously gotten the Power Chicken Hummus Bowl, and it was pretty good, but then I found that they have a Power Mediterranean Chicken salad, which includes bacon, so of course I went for the bacon. Clocking in at only 360 calories but with 35 grams of protein, I was very impressed not only by how this pretty salad looked but how great it made me feel. Dinner was an old favorite: stir fry. I pretty much just use the kitchen sink for these–zucchini, broccoli, carrots, onions, bell peppers, chicken. Then I threw some coconut aminos, almond butter, and sesame oil into the food processor for sauce and voila easy dinner. I honestly don’t miss the rice I used to eat with it. Tonight’s dinner was KILLER (not to brag). 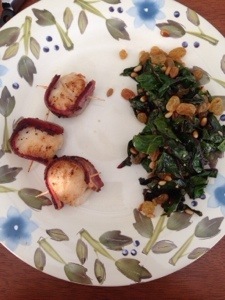 Whole Foods had scallops on sale so I scooped some up and wrapped them in the bacon I got from the local food co-op. Pan sautee to perfection and you have seafood heaven. 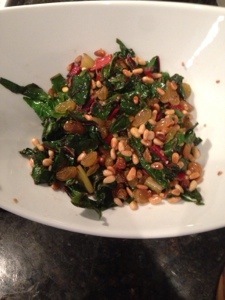 I had some swiss chard so I browsed recipes and came across Nom Nom Paleo’s Swiss Chard with Raisins, Pine Nuts, and Porkitos. 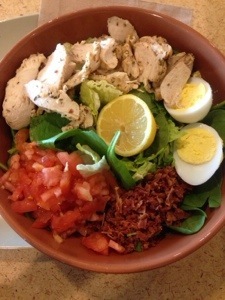 So it may not be brownies, but this was HOLY COW delicious too! Can’t get someone you’re feeding to eat their veggies? Try this. Because the scallops were wrapped in bacon I decided against adding the Porkitos (even though I had Proscuitto–new obsession); it was still amazing. The toasted pine nuts added such a richness of flavor and the golden raisins gave it just the right twang of sweetness, plus it was super easy and quick to prepare. Thank goodness I got large packs of the pine nuts and raisins because I will be making this again soon (probs tomorrow). My training was a little off this week, so I attempted to make up for it today with a 5 mile all-uphill run followed by an hour and a half of weights. I’m tired haha. 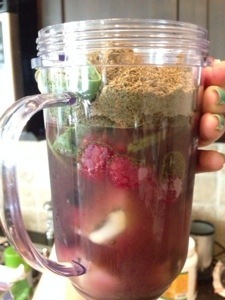 In between the run and the weights I had a beautiful smoothie with 1 banana, blueberries, raspberries, spinach, Trader Joe’s Organic Hemp protein, and a little bit of coconut water so this helped me get through it all. Tomorrow I’m planning on checking off the 8 mile run my training plan tells me I have to complete. I’m hoping by writing it here that means I have to do it right? So I have a question for all my runners: do you like to do your runs in the morning first thing, or later in the day? With my new schedule I’m stuck with either waking up hella early or waiting to the afternoon where I’m equally as tired but I also have a full stomach to get in the way.